The Jewish Study Network is a unique resource dedicated to raising the level of Jewish literacy in the Greater San Francisco Bay Area. Recognizing that Jewish education is vital to creating a vibrant future for Jews in America, the JSN creates a host of extraordinary learning opportunities for the local Jewish community. Learning is not a uniform process for all individuals. For this reason, the Jewish Study Network designs a wide range of educational opportunities to cater to multiple interests and skill levels. From introductory classes on the weekly Torah portion to advanced lectures on Talmud, from holiday celebrations to experiential service-learning, from large lectures to one-on-one study, the JSN has programs that bring the excitement of Jewish learning to everyone. The JSN regularly hosts guest lecturers and recognized scholars. These world-renowned speakers combine a great teaching talent with an extraordinary level of Jewish wisdom and knowledge. JSN is interested in sharing our teaching and knowledge throughout the community. We organize programs independently and we partner with a variety of other organizations to enhance their own offerings. We, and our donors, view our services as a community resource. We are a not for profit organization focused on improving the Jewish literacy of the Bay Area. We are not affiliated with any specific movement or organization and have teachers who grew up in varying streams of Jewish practice. Although we are traditional in our own practice and schooled to teach traditional explanations of Jewish law, we welcome students of all backgrounds and are not interested in placing people inside a specific box or painting them a particular color. We are a group of educators with a passion for Jewish education, and the skills required to share our heritage with Jews looking to enrich their understanding of Judaism. 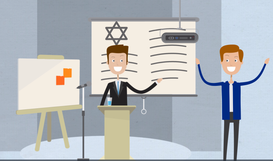 Watch our explainer video to get a better idea of what we do.